Professional Photography by Megan Maloy Photography. Our design process begins with us viewing your outdoor space and brainstorming the ways in which the space might evolve. We will discuss your likes and dislikes as well as your practical demands of the space and other topics essential to create your unique, perfect out-door room. We then follow up with a broad outline of the design concept. Once a design is commissioned, we return to document the space(s). Next, a design will be rendered by hand and a fully conceived Design Plan created and presented. Maintenance services include pruning plants, small ornamental trees, and shrubs; fertilizing, irrigating, and mulching beds; mowing, aerating, fertilizing, over-seeding, and mulching of lawns; and raking and sweeping. 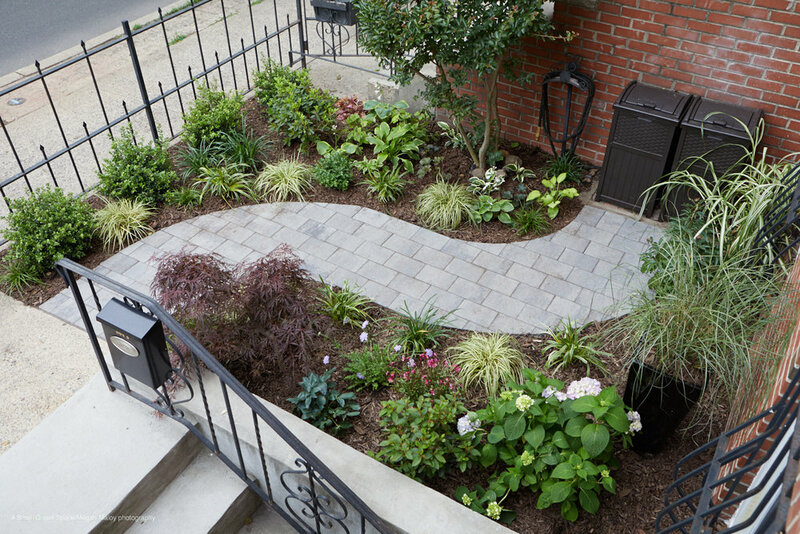 Our team of professional urban gardeners will leave your space ready for you to enjoy. A youthful space reminiscent of a bygone era. Our hip, young client lives in a small condo in downtown Jersey City. The project's budget was tight so our design called for up-cycling whatever materials could be salvaged. We wanted a retro feel for the space, so we incorporated: clean lines; simple evergreen plantings and the "perfect slice of lawn". And ultimately created a miniature replica of the ideal American yard of the 1950's & early 1960's. 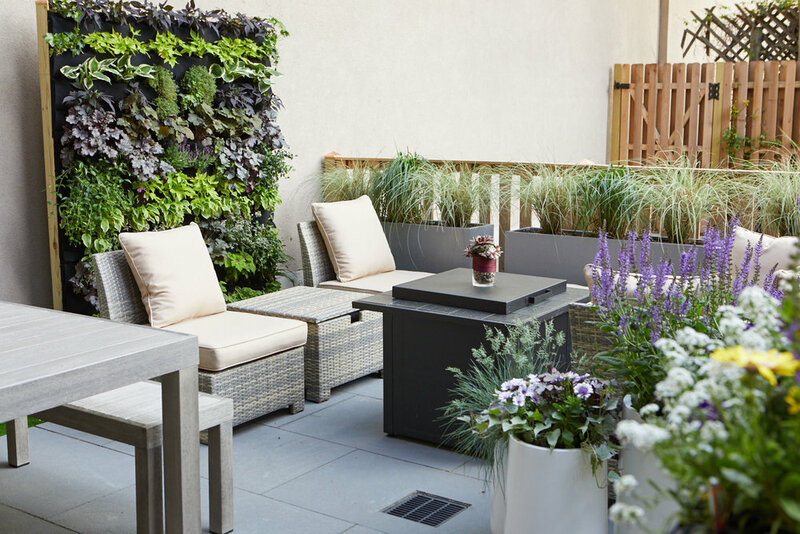 A chic city courtyard showcases an accent green wall. This is a small, private, condo garden in Jersey City. It is a private slice of garden within a larger communal space. The design was to create a contemporary space that could be used for a variety of different activities: child's play; adult lounge; fire-pit area; dining; "lush garden"; and private relaxation. The design challenge was to create all of this within 350 square feet while creating privacy without claustrophobia. 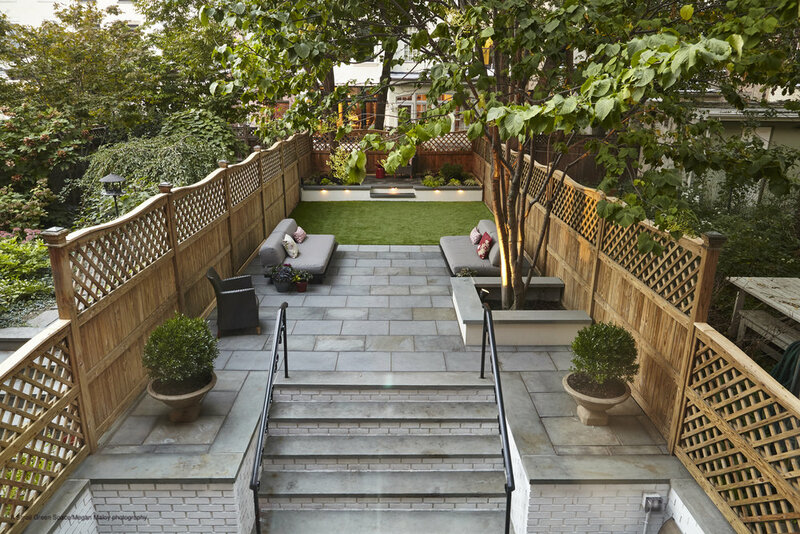 This courtyard belongs to a small, basement level apartment in Hoboken, NJ. The space was under 6 feet of water during Super Storm Sandy and had not been rehabbed since. Our design called to create a stylish outdoor 'living' room, thereby extending our client's living space. 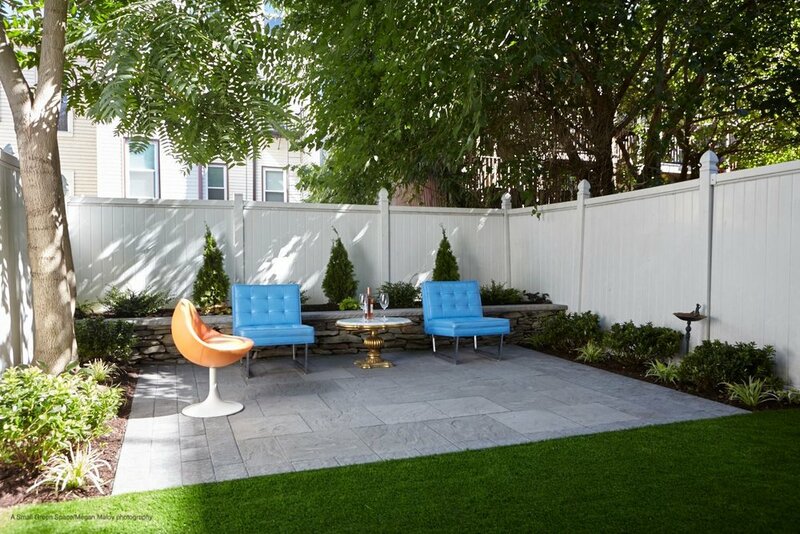 We incorporated clean lines with a bluestone patio, artificial lawn, cedar horizontal fencing, custom built-in seating/ planters and low voltage lighting.